Ten tops ways to get on the Tahini train. I remember buying my first jar of tahini. It was about two years ago, and I was making a roast pumpkin hummus with my brand new red food processor. So I used the requested 2 tablespoons of tahini, and was left thinking, ‘What on earth am I going to use this for next?’. Within twelve hours, on serving said hummus, two friends also asked the question, ‘What can we use tahini for?’ It does seem to be one of those things we may have in the cupboard, but it just sitting there, collecting dust until the next batch of hummus is desired. For those of you not familiar with Tahini..
It’s a paste, similar to my beloved peanut butter, but made from sesame seeds. The sesame seeds are either hulled or not, then lightly toasted and stone ground into a paste. It is often used in Middle Eastern, Turkish & African cuisines. Naturally cholesterol, gluten and dairy free, it is a good source of healthy fats. It is high in Vitamin E and a valuable source of Iron and Magnesium. The not-as-creamy unhulled variety gives the added bonus of calcium and extra dietary fibre so a great addition to a vegan diet. The flavour is slightly different, someone would say bitter, but still good. You will find it in the health food aisle of your supermarket. Either hulled or unhulled. And I also understand there is a black sesame variety which I am yet to try. Anyway, where was I with my tahini tales? Oh yes, that’s right. Well two years later and I am well and truly on the tahini train. It’s a really good ride. My absolute favourite way to use it is on porridge. In particular, carrot cake porridge. Basically I cook my oats on the stove in vanilla unsweetened almond milk. I add in the carrot, cinnamon, sometimes sultanas, some extra water and cook some more. Place in a bowl, top with a generous serve of tahini that just spreads over the oats. To top it off – some warmed milk, a drizzle of maple syrup and a sprinkle of seeds or crunchy clusters. I then proceed to eat the porridge around the dollop of tahini, and I always finish with a mouthful that has a 2:1 ratio of tahini to oats. It is absolutely d i v i n e.
However, somehow carrot cake porridge is not every one’s thing. But not to worry, I’ve put together a list of some other ways to use tahini and there is no mention of porridge of hommus. Breakfast, lunch, dinner and snacks. Sweet and savoury. I’ve got you covered. 1. Go-to-Granola. This I’m-assuming-it’s-delicious recipe from dietetic student Laura Ford will be out in force as soon as I get through my large stash of Carman’s muesli. Three down, two to go. 2. Spread it on a slice of seedy sourdough. Add a drizzle of maple syrup and a sprinkle of sea salt, and you have a wonderful combination on your plate. 4. I love to have a tofu & vegetable stir-fry with a drizzle of tahini. 5. Make up a dressing of greek-yoghurt, tahini, lemon juice & crushed garlic and add to your Moroccan chicken wraps and couscous salads. 6. Swap your hummus for Baba Ghanoush for something different. Honey-roasted carrots with tahini yoghurt – another Ottolenghi gem. 8. 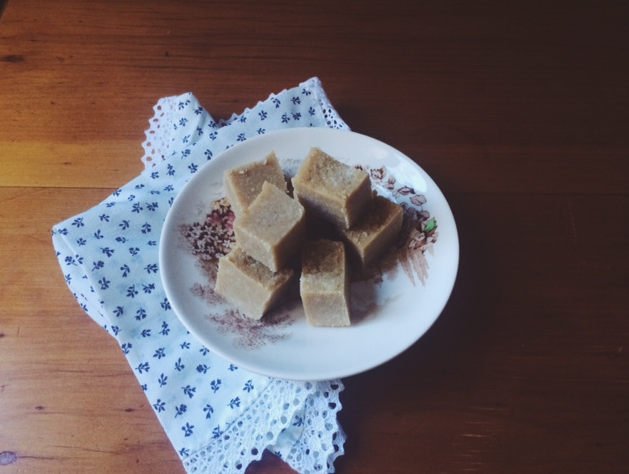 Try this Tahini Maca fudge from the lovely Heidi – I hear it is a must do. 9. Looking for a alternative Anzac biscuits recipe? While it is not really an Anzac biscuit, these sound delicious. Tahini sugar free Anzac biscuits. And for number ten, a delicious treat that is high up on my recipe to do list. Courtesy of Yotam Ottolenghi’s Plenty More. My new favourite (and tahini filled) cookbook. 10. Grilled banana bread with tahini and honeycomb. Yes. The recipe can be found here. I hope I have inspired you to remove the dusty jar of tahini from the shelf and join me on board the tahini train. My next stop – black tahini. < A Liebster Award Nomination.